Peter I dreamed of turning St. Petersburg into a Russian Venice, believing that the citizens will move through the water channels on ferries, boats, floating crossings. But the city of Peter became the city of bridges. And each of them has its own history. Dvortsovy bridge connects the city center and Vasilievsky island. Its cast-iron spans rising into the sky against the background of the Petropavlovskiy Cathedral became one of the unofficial symbols of St. Petersburg. They built a bridge to make it easier to get to the exchange and the commercial port. The society of civil engineers in 1901 set a difficult task: "to create a work of art worthy of the environment," that is, the Admiralty, the Zimniy Palace, and the Exchange building. Just reviewed 55 sketches, and built — in a St. Petersburg engineer, Andrzej Pshenichnogo. The first tests of the grandiose construction took place in 1916: 34 cars entered the bridge, with a cargo of 600 pounds each. To complete the architectural appearance of the bridge was only in 1939, when it was complemented by a cast-iron lattice work of the architect Leo Nenova, but they conceived large lampposts, decorated with eagles, on the piers of the bridge never appeared. 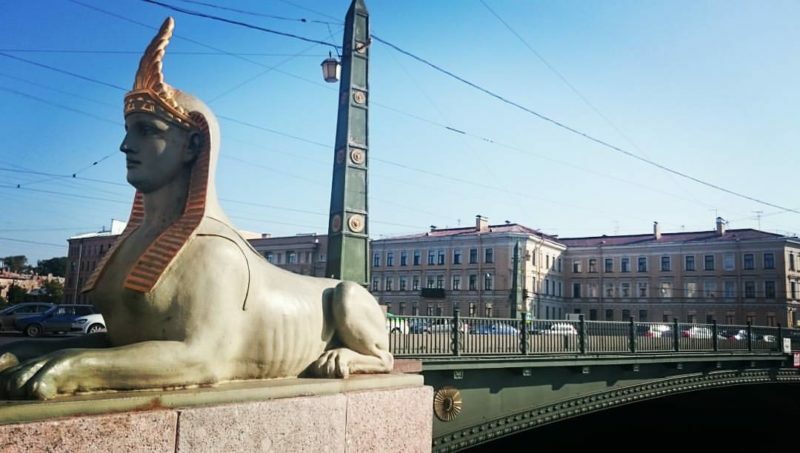 The stone crossing over the Fontanka river between Pokrovsky and Bezymyanny Islands is guarded by majestic sphinxes on granite pedestals-the only surviving decorative elements of the once luxuriously decorated bridge. Portals covered with gilded ornaments, iron railings, designed in the" Egyptian manner", cornice with the image of the God RA in the form of a winged sun — such suspension bridge appeared during the opening in 1826. After almost 80 years, he collapsed under a squadron of guards cavalry, towards which 11 sledges with drivers were moving — they could not stand the chain. The city immediately spread rumors that the culprit was thrown into the hearts of the phrase of a local resident: "That you all failed! "Anyway, after the tragedy, a temporary bridge was opened, and only half a century later a new one was built. The first bridge "behind The great Neva on the Fountain river" was built by the decree of Peter I by the forces of the engineering battalion of Mikhail Anichkov and named after him. Anichkov called and wooden bridge, built over 300 years ago, and stone, with turrets, which replaced its predecessor in 1785, and modern, with the image of seahorses and mermaids. Cast iron railings, made according to the drawing of the German architect Karl Schinkel, echoed with the ornament of the railing of the Dvortsovy bridge in Berlin. The famous statue "taming the horse" by Peter Klodt decorated the bridge in 1841: two sculptural groups were made of bronze, and two — of painted plaster, as two of the four bronze statues right after casting Nicholas I sent to Berlin as a gift to the Prussian king Friedrich Wilhelm IV. Another pair of "tamers" to the destination, too, did not get: by Imperial decree, they were sent to Naples. 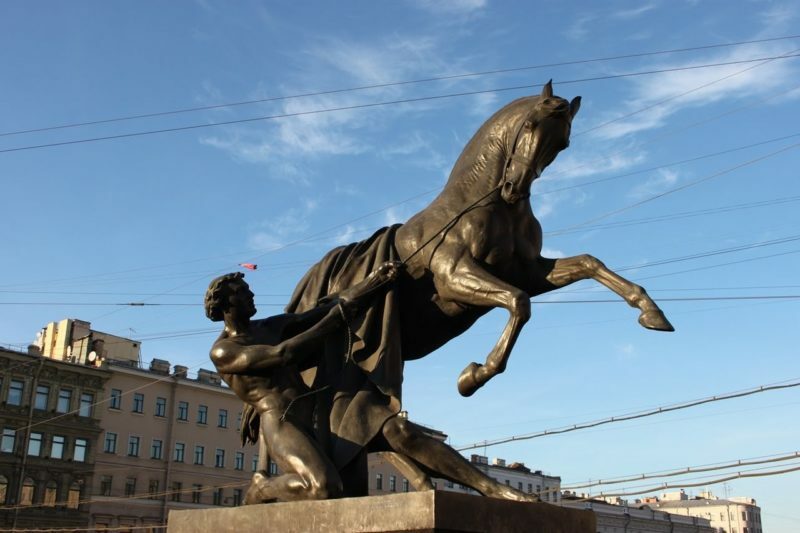 Full bronze set of sculptures of the Anichkov bridge was only in 1851. One of the three surviving pedestrian chain — or hanging-bridges of St. Petersburg. The crossing of the canal to hold the iron lions of the work of Pavel Sokolov. He was a famous sculptor," master of carved art "at the Admiralty and the author of the famous Tsarskoye Selo fountain"Girl with a jug". Lviv was originally going to be minted from copper sheets, but in the end was cast iron and painted as faux marble. One of the leading bridge builders of that time — engineer Wilhelm von Tretter-developed the project of the crossing. The bridge connecting the Kazan and Spassky Islands was opened in the summer of 1826, and on the first day it was crossed by 2700 residents of the city. The brother of the "bridge of four lvov", its smaller copy, is located in the Berlin Tiergarten Park. Loevenbruck, built 12 years after the original, was the first suspension bridge of the German capital. 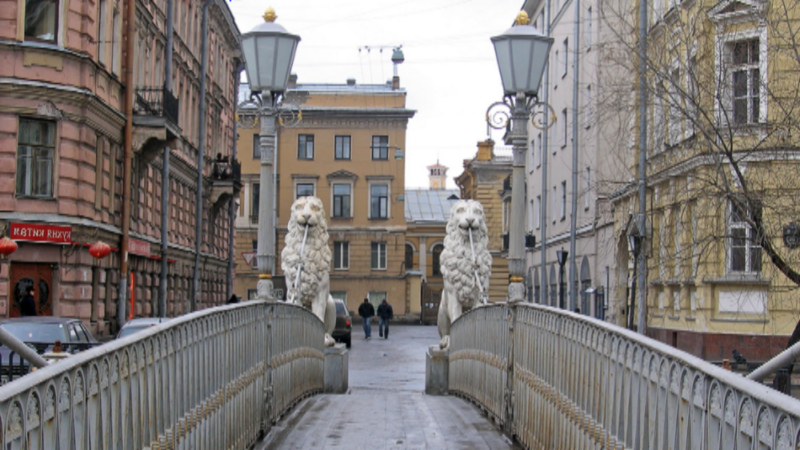 "Winged lion sits with a winged lion," wrote the Leningrad poet and literary critic Dmitry Bobyshev in the twentieth century about the bridge built a century earlier. 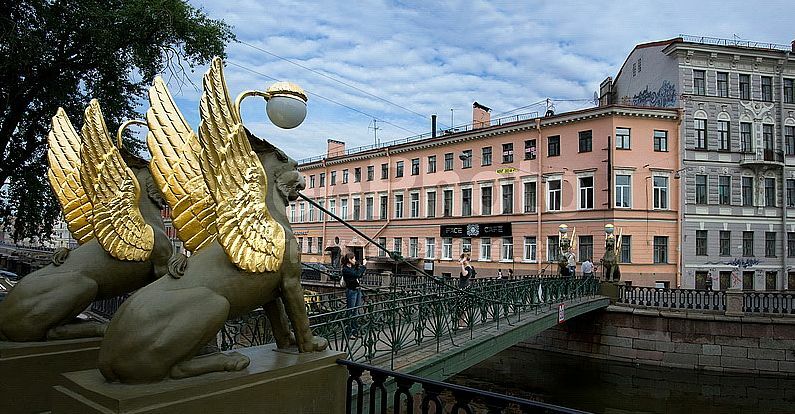 According to legend, winged lions are formidable creatures that protect gold, and it is symbolic that these mythical animals are located near the building of the assignation Bank, the current state economic University of St. Petersburg. Sculptures of winged lions-the work of Pavel Sokolov. The statues were cast at the Alexander iron foundry, the wings were minted from copper and covered with gold leaf. Later winged lions appeared on the emblem of the factory named after Krupskaya. Bankovskiy bridge is the narrowest bridge of the Northern capital, the width of only 1 meter 80 centimeters — one of the favorite among tourists. They believe that if you leave a coin at the foot of a lion, you can improve your financial situation. 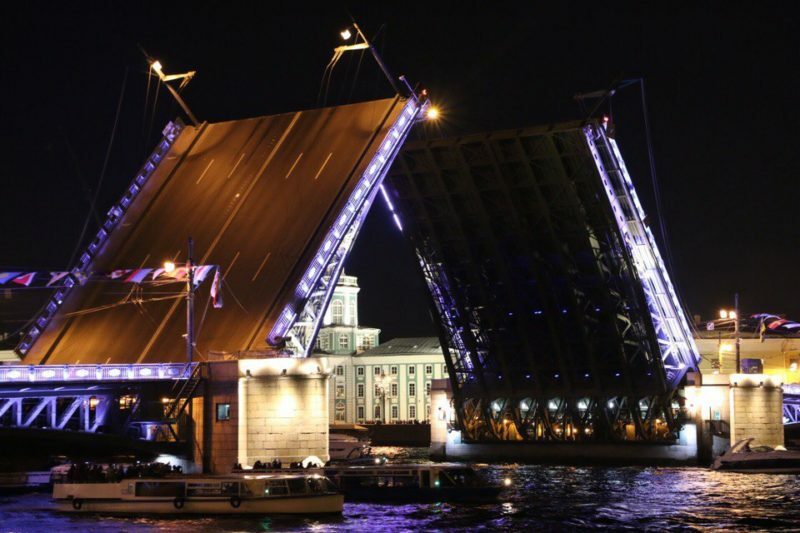 One of the oldest bridges of St. Petersburg was built through the Winter canal in the 60s of the XVIII century on the site of the first wooden drawbridge. In different years it was called Zimnedvortsovy and Verhnaberezhny. 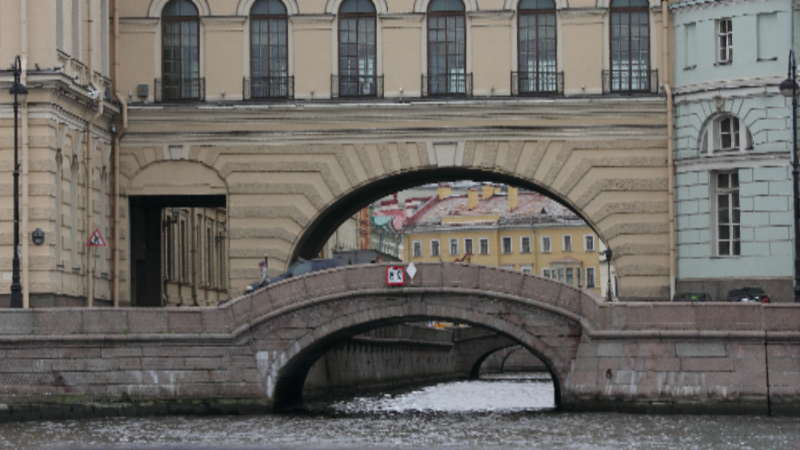 When connecting the buildings of the Old Hermitage and the Hermitage theatre with the passage-gallery above the water, the bridge was harmoniously supplemented by an arch. The romantic view of this bridge and the tragic history of Pushkin's "Queen of Spades" inspired Pyotr Tchaikovsky to create the Opera of the same name. In the third step, the Lisa with the words "he's Dead, he died, and with it I am! "- the channel from the Hermitage bridge is thrown into the water, and maybe that's why the bridge got another, unofficial, name "Lisa's bridge". 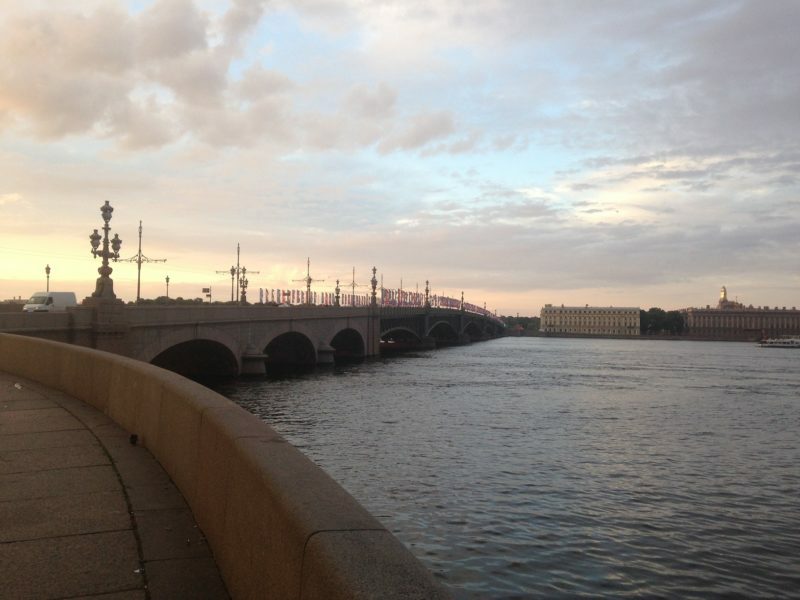 Troitsky bridge was built to the 200th anniversary of St. Petersburg-work on its construction lasted almost 20 years. In 1882, an international competition was announced for projects of permanent crossing instead of the longest floating bridge in St. Petersburg with a length of more than 500 meters. The first prize was given to Alexander Gustave Eiffel, the Creator of the famous Paris tower. But the Eiffel bridge was not built, as his compatriots from the company "batignol" proposed a project that significantly reduced the consumption of metal. The final version of the drawings, the company worked together with the St. Petersburg Academy of arts in the face of architects Leontius Benois, Alexander Pomerantsev and Robert Gedike. The first solemn divorce Troitsky bridge held Nicholas II, personally pressing the button mechanism. Over the years, the bridge was called the Kirov and the bridge was considered fateful. According to legend, is the famous flying ACE Valery Chkalov. It is not known whether there was such an episode in the life of the heroic pilot, but the pilot Evgeny Borisenko flew under this bridge on a seaplane in 1940 on the set of the film "Valery Chkalov".